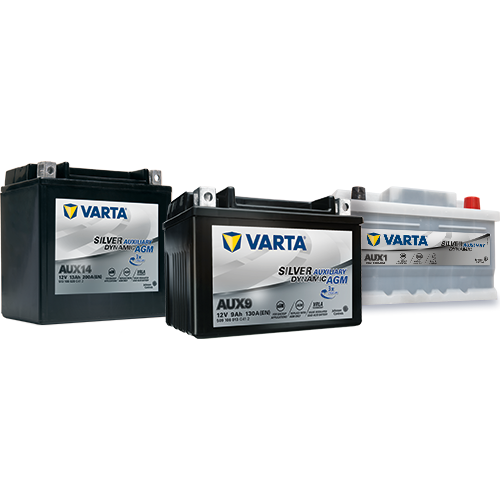 Johnson Controls Power Solutions introduces its new VARTA Silver Dynamic Auxiliary battery range in the European market to address the increasing electrical loads to support comfort features, safety devices, and fuel-saving functions in vehicles for today, into tomorrow. The VARTA Silver Dynamic Auxiliary range provides two different technology solutions – AGM and conventional flooded – to support this increasing electrification especially in dual-battery systems. Many vehicles with an internal-combustion engine have two batteries; a regular 12 volt starter battery and an auxiliary battery – known as a “dual-battery system.” More than 10% of the car parc with start-stop technology are already equipped with dual-battery systems in order to meet the increased power demands. This percentage is expected to grow even further with the ever-growing number of electrical consumers in start-stop cars. The VARTA Silver Dynamic Auxiliary is designed to support back up applications. Depending on the make and model of the car, auxiliary batteries service different functions. These include: The increase of the start-stop function’s duration, support of comfort functions during engine start, support and protection of electrical systems (i.e. brake-by-wire) and emergency support. By providing a full range, VARTA offers a “like-for-like” replacement option. When it comes to replacing a weak or defective auxiliary battery, it is vital to rely on a high performing substitute. All VARTA Silver Dynamic Auxiliary batteries are specifically designed for backup applications. Both the AGM and SLI, are maintenance free and equipped with a flame arrestor. An EN compliant degassing hole is also built-in to enable the installation in the passenger cabin and luggage compartment. The Silver Dynamic Auxiliary AGM is spill and leak proof, and comes with three times the cycle life of a conventional SLI battery. To avoid the risk of malfunctions and car breakdowns it is important to always replace an AGM auxiliary battery with another AGM auxiliary battery. Not sure where the battery is located or which technology to choose? When it comes to the replacement of auxiliary batteries it is essential to know the different installation positions depending on car make and model. Since February 2017 Johnson Controls provides workshops with the VARTA Partner Portal. Many workshops rely on the portal’s battery position guide, battery selection section, fitting instructions and battery knowledge page. All the information can be found on any internet-enabled device. This ensures that the VARTA Partner Portal is available anywhere and at any time. Furthermore, Johnson Controls enables workshops to expand their service by offering battery replacement for start-stop vehicles and in turn reduce their efforts thus saving valuable time and costs.